We had the Star Wars theme going on at our house. 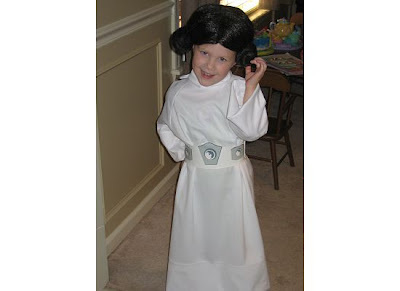 Jim has Laura hooked on Star Wars, so it was no surprise when she requested to be Princess Leia for Halloween. 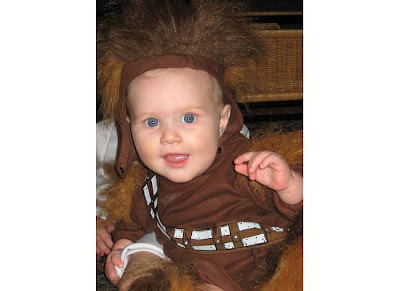 Grant was the perfect little Chewbecca. The odd thing about trick or treating this year was that our neighborhood is apparently a "hot spot" for all the nearby rural areas. Therefore, we had a bunch of trucks with a crew of kids in the back riding to trick or treat. Aren't you supposed to walk when you trick or treat? Isn't that half the fun? So we had to be extra cautious walking the streets and we found that not a lot of houses had their lights on for trick or treaters. Regardless we still had fun and Laura enjoyed herself immensely. The funny thing about Laura is that she really isn't that into candy. I think she's had maybe two pieces of candy from her bag. She has enjoyed "playing" trick or treat today handing us her candy, but she hasn't really been interested in eating it! Crazy child! I'm looking forward to Thursday!!!!!!!!! 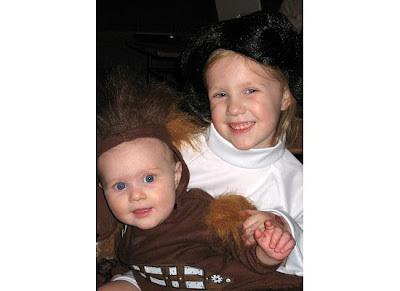 Grant in that Chewwie costume is the cutest thing I have ever seen!!!!!!! Oh to be uninterested in candy. I'm about to throw all of our out because I can't seem to stay out of it. Sigh. I was really hoping that you and Jim were going with the theme too ;). They sure are cute! Love the costumes!! Maybe Laura can donate some of that uneaten candy to the Clemmons household:) We would gladly take it off her hands:) I am so sad that we are going to miss you guys this weekend!! We are heading to Nashville:( Have a wonderful visit, and we will miss you! !